The NEX was selling several different print of the Bumkins All-In-One one size diaper. We bought two: one in the Cat in the Hat print, and one in the Blue Pixel print. The prints were perfect. I love Dr. Seuss, and the Blue Pixel print reminded me of my husband’s Navy uniforms. 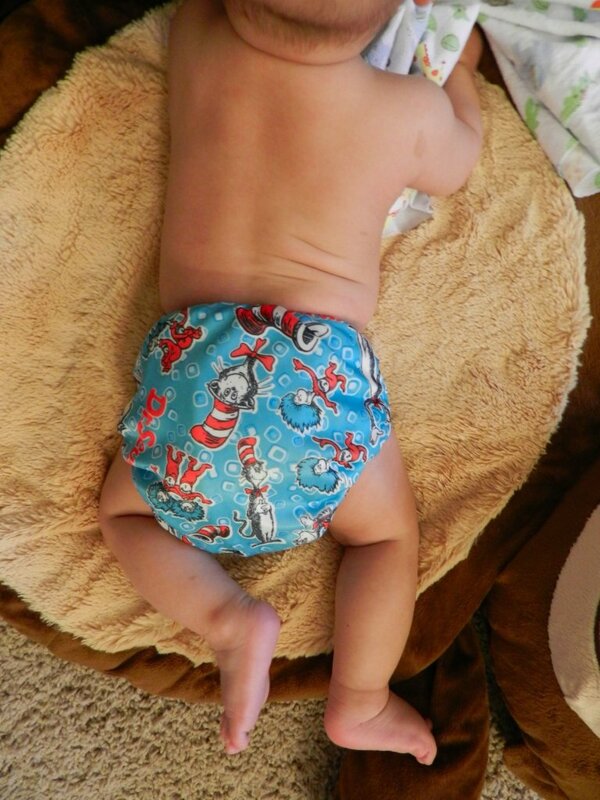 All-in-one styles of cloth diapers are great, because they’re essentially one piece. 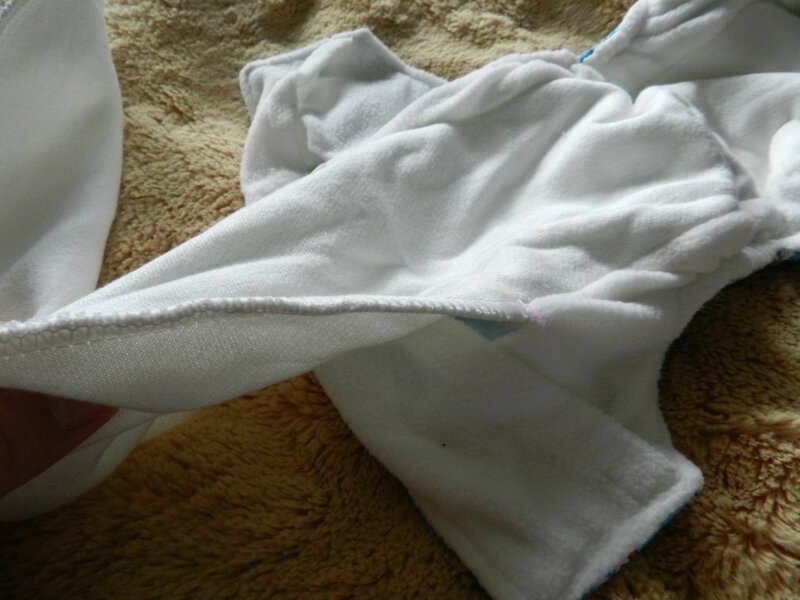 For cloth diapers, this makes them the closest to a disposable. 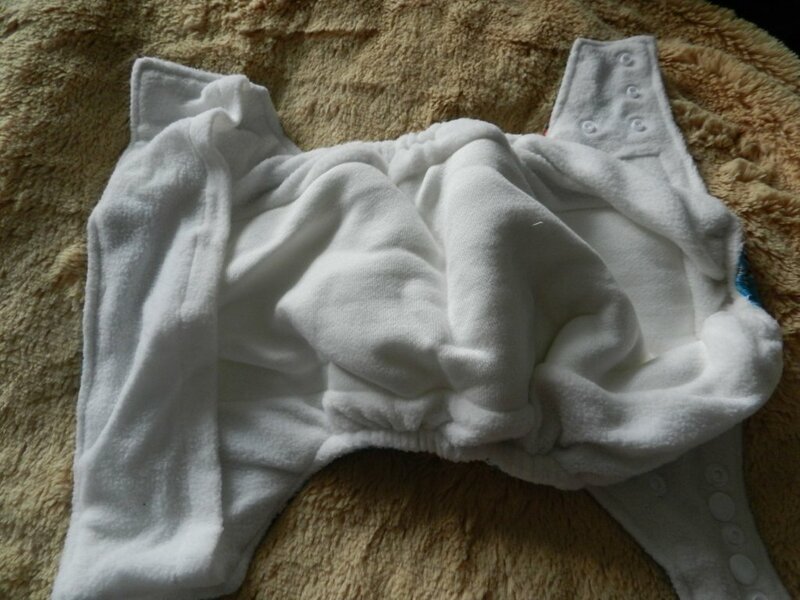 Caregivers, reluctant cloth diaperers (husbands), daycares, and nursery workers may find this style the easiest to use. The negative of an AI1 diaper is they usually take a long time to dry. The Bumkins AI1 is a one-size diaper. The three rows of snaps on the front of the diaper allow the rise to be adjusted. There’s one row of waist snaps, as well as hip snaps. The snaps allow the diaper to be adjusted to fit babies from approximately 9-35 lbs. The outer shell is made from waterproof PUL fabric with TPU, making it stain and odor resistant. The diaper comes in either a hook and loop or snap closure. If you’re out and about, and baby poops, just roll the diaper up and fasten the waist snaps (or hook and loop) before placing in your wet bag. This will keep the poop contained until you get home. The inside of this diaper has stayed very soft, despite using and washing every other day for weeks now. I love putting this on my son, because of the softness! The center panel on the inside of the diaper is made of an absorbent cotton and bamboo rayon blend fabric. The panel is surrounded by fleece to wick moisture away from baby’s skin, keeping him dry and comfortable. 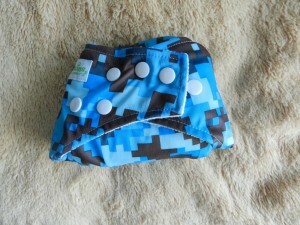 The center panel actually folds down and snaps inside a pocket that opens at the front of the diaper. This gives the diaper an extra layer of bamboo absorbency without a ridiculously long drying time. The opening and pocket at the front of the diaper is wide enough, that you can even add another insert for more absorbency! For heavy-wetters or older babies, this is a great option to have in an all-in-one diaper. The fold-in panel can be unsnapped and pulled out, making this diaper very quick to dry…especially for an all-in-one diaper, and one with bamboo, at that! Since this diaper has bamboo fabric, it needs to be prepped before you use it the first time, by washing it several times. It does not need to be dried in between wash cycles. The daily care for these diapers is simple: machine wash on hot (don’t forget your extra rinse cycles!) and tumble dry on low. I line dry most of my diapers, to save energy and prolong the life of the fabric. The sun is also a wonderful natural disinfectant and stain remover! I’ve noticed that you do not need to unsnap the fold-in panel before washing, and it will still get cleaned. After it’s washed, I’ll pull the panel out to speed up drying, and then place the diaper in full sun (with the colored, outer side facing away from the sun). 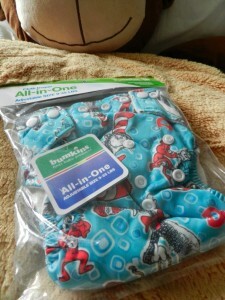 The Bumkins AI1 dries much quicker than my other AI1s and my other bamboo blend fabrics. Mr. Stinky Pants is four months and about 16 lbs. in this photo. I’m using the middle row of snaps, but I can stretch the first row and have him wear the rise on the smallest setting. Between the hip, waist, and rise snaps, I’m able to get a good fit on this diaper. So far it’s contained my son’s poop (but I can say that about all of his cloth diapers, since he’s never had a blow out in cloth). There’s plenty of room to grow in this diaper, and I could see it fitting him until potty training. On the flip side, this diaper probably will not work for newborns or very small babies, but that’s true of many one-size diapers (see my list of newborn and preemie-appropriate diapers here). I only have one complaint with this diaper. The fold-in panel is made to fit the diaper at its largest setting. 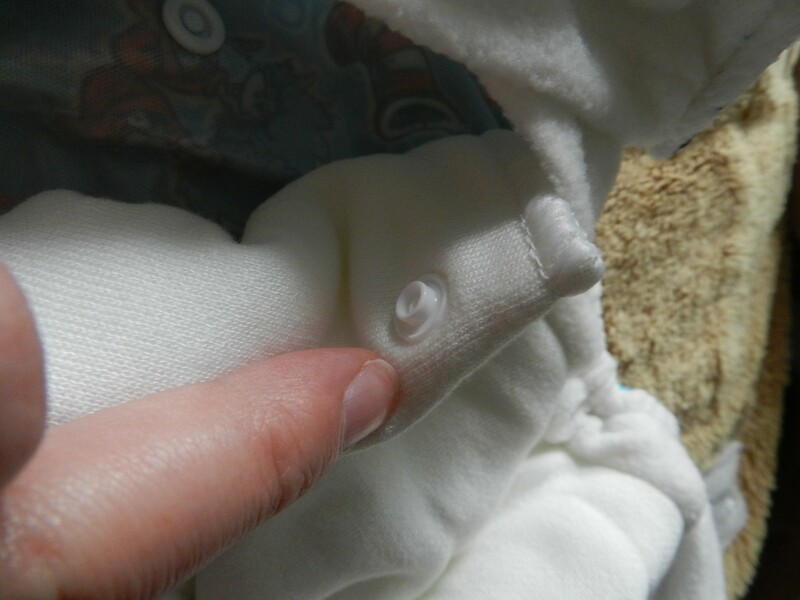 This means, if the diaper is at a smaller setting, you have to put your hand all the way inside the diaper, and fiddle with the panel at the very end (back) to get it folded under to fit. Otherwise, the inside of your diaper will be lumpy with the extra fabric squished around. At first it was annoying to do this, but I’ve gotten the hang of it and can do it quickly now. All in all, I love this diaper and definitely recommend it! I think it would be a great addition to anyone’s stash. This diaper comes in a bunch of different prints, so make sure you’ve shopped around to find one you like. Amazon has several listings with different prints. Also on Amazon is a Bumkins AI1 that is not a one-size diaper (I believe it’s a discontinued style), so again, make sure you’re buying exactly what you want. I’ve seen this diaper retailed from $16.95-18.95, but if you’re lucky enough to have access to a military exchange, I bought ours for $12.99 each, no tax! That’s a steal! Note: This review contains affiliate link. I was not compensated for this review. I purchased the items reviewed above. The opinions are my own and may differ from yours. So about polyurethane laminate and thermoplastic polyurethane materials… the other day, my husband and I were joking around about how hybrid cars are not nearly as environmentally friendly as the car companies would like us to believe (if you’re interested and have time, look up the manufacturing, shipping, and eventual disposal processes for just the battery alone.) Anyways, it got me wondering about other environmentally friendly things, and I thought of cloth diaper covers. I know TPU is used in instrument panels for cars and in cell phones and I think it’s biodegradable, but it’s not something that I would think of as being environmentally friendly as far as the manufacturing process goes. I also remember having PUL materials in some of the clinics I’ve worked in, and I know that’s not biodegradable, and same thing about the manufacturing process. Plastics are generally derived from oil, and that whole process isn’t exactly nature-friendly. All jesting aside, I was just wondering what your thoughts are on that, and your readers’ thoughts, too. I know it’s still better than clogging up landfills with disposables, but I do want to know your thoughts on the hidden drawbacks that the manufacturers don’t like to focus on when it comes to using the synthetic materials. Well, I agree that there are hidden drawbacks to anything, really, that is being manufactured. For example, the cotton used in many cloth diapers is planted, harvested, and woven into fabric by machines. There’s transportation involved in everything, so you have to factor in fuel, etc. Bamboo is considered by many to be a sustainable crop, but when it’s manufactured into fabrics, again, machinery and chemicals are involved. Organic cotton is strictly regulated in the U.S. to ensure it’s grown without pesticides, but again, you still have everything that occurs after it’s grown. TPU and PUL…now that’s different. To be honest, I’m not that familiar with the manufacturing process. I’ll have to research it some more and get back to you. I do like to focus on the landfill issue of disposables. I think that is the main point that makes cloth diapers more environmentally-friendly. I hesitate to say this, but there are quite a few things that cloth diaper advocates will tout as fact, when they really aren’t fact. Or they’ll state things out of context. 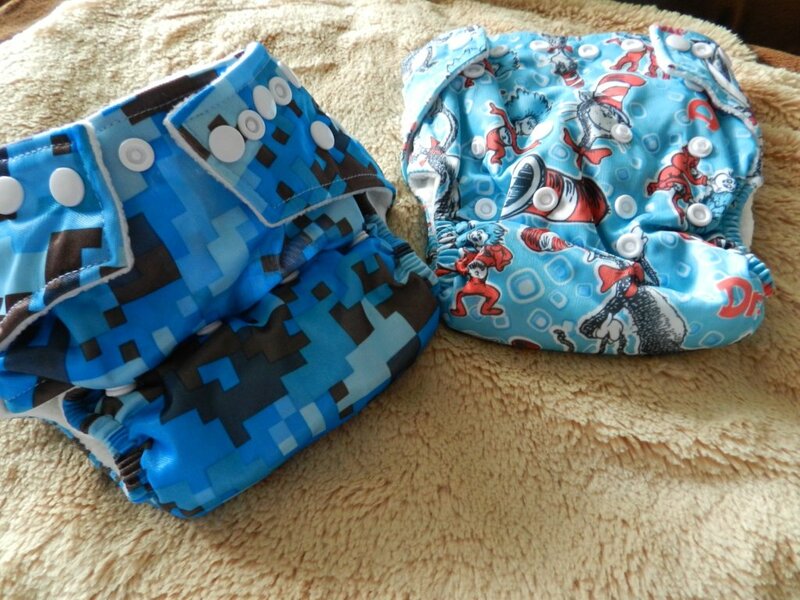 My post on choosing cloth diapers over disposables really covers the different supposed positives and negatives and the factual positive and negatives. Oh, and my daughter would go nuts over that last picture. Cat in the Hat is her favorite. I’m so excited I found your blog, I am also a navy wife and am going to cloth diaper. So excited you mentioned the NEX prices, I had no idea they sold cloth there! Thank you! Just hoping my NEX sells them too! Hi Juju, thanks for commenting! I’ve spotted Bumkins AI1s and their liners in three different NEXs in the Hampton Roads area, so hopefully they’ll have them at your store too! Maybe you can request some if they don’t? You could also check AAFES online.